Riverside Doctors' Hospital Williamsburg rated best in the state by patients. The 2019 ranking marks the second consecutive year that Riverside Doctors’ Hospital Williamsburg scored higher than 80 percent on both survey questions, according to the release. “We are extremely proud of these results as it comes directly from the patients we care for and reflects the teamwork and high-quality care provided at Riverside Doctors’ Hospital Williamsburg,” said Adria Vanhoozier, hospital vice president and administrator. “It also underscores our team’s unwavering commitment to the Riverside Health System mission of caring for others as we would care for those we love. ”Data for the report was collected from a Hospital Consumer Assessment of Healthcare Providers and Systems survey conducted in 2017 by the Centers for Medicare & Medicaid Services, according to the report. Riverside Doctors’ Hospital Williamsburg opened on Commonwealth Avenue in 2013, offers 40 private patient rooms, and is a Certified Primary Stroke Center. Other recent accolades for the hospital have included a 2017 QUEST Award for High-Value Healthcare from Premier Inc, according to the release. “Across every department at Riverside Doctors’ Hospital Williamsburg are teams of professionals that have a true passion for world-class service and patient care, and these survey findings confirm precisely that,” said Dr. James W. McCorry, service line chief and emergency department medical director at the Williamsburg hospital. For more information, visit riversideonline.com/RDHW. The New York Times Names Williamsburg 12th out of 52 places to go in 2019! 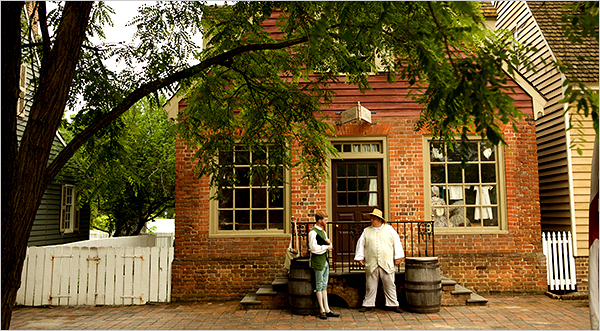 In 1619, the area that includes the Jamestown Settlement, Williamsburg and Yorktown was home to some of the most significant events in American history: the official arrival of the first African slaves to North America, the convening of the first representative assembly in America and the first recorded proclamation of Thanksgiving in the New World. The area will observe the 400th anniversary of these events all year, highlighted by the Tenacity exhibition at the Jamestown Settlement, which recognizes the contributions of women during the Colonial era, along with an archaeology-focused exhibit in Jamestown. Colonial Williamsburg, the expansive living-history museum, will give visitors a taste of life in the 18th century, along with the re-imagined American Revolution Museum at Yorktown. For thrill-seekers, Busch Gardens Williamsburg, the European-themed amusement park, will unveil a new pendulum swing ride, while Water Country U.S.A. will launch the state’s first hybrid water coaster. Craig Dean inside a house off Mediterranean Avenue in Virginia Beach on Aug. 12, 2016, that he manages and lists on Airbnb for a friend. Letting strangers into their homes is earning extra cash for more property owners in the region. Hampton Roads residents who put rooms — or their entire homes — up for rent for a few nights in 2018 made nearly $19 million, collectively. The numbers reflect only rentals through Airbnb, the largest of the home-sharing platforms that connect hosts with potential renters who want to stay in houses, apartments or rooms instead of hotels. Virginia Beach topped the area list for the most guest bookings and revenue, at 55,900 bookings for $9.3 million. That’s roughly $167 per booking, though rates vary depending on factors such as length of stay, location and space size. Norfolk and Williamsburg were the only other cities to top $1 million in revenue from Airbnb guests. There were 30,900 bookings for $4.5 million in Norfolk and 23,700 bookings for $2.6 million in Williamsburg. Hampton followed with 6,900 bookings for $932,000, then Chesapeake with 5,300 bookings for $653,600. Portsmouth and Newport News weren’t as popular. Portsmouth brought in 3,200 bookings for $449,200, while 3,700 bookings were made in Newport News for $436,300. Suffolk trailed among area cities with 650 bookings for $105,300. It was not immediately clear whether the numbers represent an increase or decrease in Airbnb business in the region; the company declined to release 2017 numbers to The Virginian-Pilot. “We do not have numbers from last year immediately available,” said Airbnb Northeast Press Secretary Liz DeBold Fusco. Compared to other cities in the state, Hampton Roads locales fared well. Charlottesville was neck-and-neck with Virginia Beach, while Richmond and Alexandria had fewer bookings and revenue: 67,800 for $7.8 million and 37,200 for $6.8 million, respectively. DeBold Fusco said in an email that city rankings were not immediately available and that data would be released for nearly every state this year, but there was no “particular rhyme or reason” for which states will receive data. Around 10,200 Virginia Airbnb hosts received nearly $104 million and recorded almost 750,000 bookings in 2018. Virginia hosts typically earn around $5,500 annually, according to Airbnb. The lead plaintiff in Virginia's Chinese drywall fight is still fighting the Chinese company that sickened her and thousands of others in their homes. But seven years later Michelle Germano can now get a bit of relief. The Norfolk woman finally has received a deed in lieu of foreclosure from her bank allowing her to walk away from her condo mortgage, and with it the monthly condo association fees that had driven her into bankruptcy and continued to amass years after she moved out of her home that contained gas-emitting drywall. Photo taken May 4, 2016, inside a home that she now rents. It was January 2009 when Michelle Germano found out the Ocean View condo she bought at the height of the housing market was making her ill.
Its Chinese-made drywall harbored hydrogen sulfide, which destroyed electrical wiring, fried appliances, corroded personal items and sickened residents. And nearly a decade after Germano became the lead plaintiff in a federal lawsuit against the drywall maker Taishan Gypsum Co. and Beijing New Building Materials Public Limited, she sat in a Norfolk courtroom still waiting for resolution. The case is back in Norfolk's federal court after spending years in Louisiana as part of a class-action suit, and now Germano is joined by 174 other plaintiffs. At a hearing Dec. 18, it took more than an hour for lawyers to simply catch up two federal judges on the case’s long history. The next step: agree on a schedule. But even that has proven challenging. Plaintiffs' lawyers at the December hearing told the court they were certain the case could be wrapped up in 4-5 months. A table of the defendants' lawyers all shook their heads "no." Lead attorney for the plaintiffs, Richard Serpe, said nearly 100 million square feet of Chinese drywall was used during the U.S. housing boom. Of that, 7 million was sold through Norfolk-based Venture Supply, which supplied the drywall inside each of the plaintiffs' homes. Germano's was one of thousands of homes built with the material, which came into high demand after hurricanes and a housing boom had shrunk U.S. supply. Part of the case's complicated history is a web of legal suits, some that benefited homeowners, others like Germano's, that left them fighting a foreign company with a history of being non-responsive in court. The federal judge overseeing the case until now, Judge Eldon Fallon in the Eastern District Court of Louisiana, described depositions carried out in Hong Kong at one point as "ineffective" because of disagreements among interpreters, lawyers and witnesses, "and in general, ensuing chaos." Lawyers for the two Chinese companies being sued said there was genuine lack of understanding initially before the legal teams were brought on in 2015. Atlanta attorney Bernard Taylor told the Norfolk court that since then they've been trying to move as quickly as possible and ascertain who Taishan Gypsum owes and how much. "We want to resolve this case," he said.